Two years ago, Burnley were promoted as Championship runners-up behind Leicester City. Last season, their fates were again linked as they battled against relegation, with one critical moment coming almost exactly a year ago, as Matt Taylor missed a penalty to put the Clarets in front, only to slip and hit the post, with Jamie Vardy putting the Foxes in front within a minute. That would be Leicester's fourth-successive win as they ended the campaign with seven wins from nine games to stave off the drop, while Burnley were relegated. While in different divisions this term, similarities have been drawn between the sides - their formation, a version of 4-4-2, their strong mentality, and ability to win games when ceding the majority of possession to their opponents. 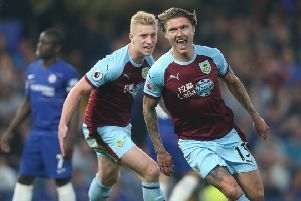 Clarets boss sees why people have compared the sides: "I think there are some tactical similarities, but it's more the nature of the beast, what they're trying to achieve as a group. "There's an earthiness and authenticity to both situations, (Claudio) Ranieri is way more experienced than me, but I don't think either of us brand anything, it's not about being more modern than the next bloke. "It's just a real, authentic bunch of people trying to achieve." And while Burnley have found a way to win when not at their best, Leicester have also been able to win ugly, promoting criticism from purists. Dyche is baffled why anyone would fail to see the romance of Leicester's success: "It is interesting where football is at. People want to celebrate what Leicester are doing, but kind of do it down as well. "Its weird. How could you not celebrate it? "People asking 'is it as good on the eye?' You ask the Leicester fans. "They are loving every single second. "What's unfashionable about seeing humans give everything? "'But they're not having 5,000 passes a game!' When has that ever gone out of fashion, seeing people give their absolute lot, every inch to be something other than the norm?" While Dyche was knocked for playing two strikers last season in the Premier League, Leicester have proved it can be done. And the pressing Dyche is a huge exponent of, is being utilised by the top two teams in the Premier League - Leicester and Spurs. Dyche said: "If you read Inverting the Pyramid, which is a good book, it explains the first kind of pressing in Europe, Graham Taylor was pressing back in the day, we have since we got here, but it doesn't get a mention. "The pitch is roughly the same size it always has been, the goals are roughly, the ball flies quicker but is the same size, and it's 11 v 11. "If you think there hasn't been a version of these things done before, you're kidding yourself. "That's what amazes me about modernism in football, I remember in the book, someone, I think I'm the 30s, playing 3-4-3 in a final, Ajax do it and everyone is 'wow', they've worked out there's 10 outfield players and 3-4-3 adds up to 10! "My view is winning will never go out of fashion, finding a way to win is the best philosophy - and I hate that word in football - because if you have a group you don't think will have 500 passes a game and win, that's not fair to them, whatever your skill set, you have to find the best way to give them a chance to deliver their skill set, while developing the other things you're maybe not as good at. "Its a pragmatic view. Ranieri said he would have wanted to play the very Italian, tactical way, but it didn't suit those players, they needed a day off, a pizza - fantastic management, looking at the culture, very Clough-like. "Look at what you want to do, how you intend to do it, and don't be afraid to give them a day off." Going back to that sliding doors moment last season, Dyche is prepared for the fine margins again as Burnley look to rejoin Leicester in the Premier League: "It comes down to those twists of fate, they're things that out of your control. Control the controllables first. Give it a chance to be productive and if you get a twist of fate great, if it goes against you, that's the way it goes."